In just a few weeks time, Drum Corps International will release its latest collection of archival-quality audio visual products, highlighted by a truly state-of-the-art high definition Blu-ray disc set that features performances from the 2011 World Championships. After beginning his drum corps career as a member of the Cavaliers, Tom Blair has been producing DCI's television and movie theater broadcasts for nearly a quarter century. He's been at the helm as drum corps performances have made their way into the homes of consumers, from public and cable television to VHS to DVD and now beyond. In this interview, Blair gives us a behind-the-scenes look at what goes into taking drum corps from the stadium field to the home theater; outlines one change which has made this year's recordings dramatically better than they've ever been before; and discusses how DCI's new Blu-ray discs give you a thrilling aural and visual experience once reserved exclusively for drum majors on the front sideline. 1. 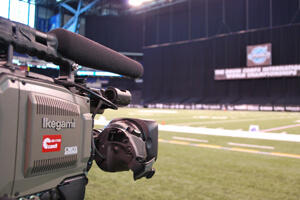 Let's start at the beginning when you and your crew come to Lucas Oil Stadium in August to capture the World Championships. How does what you do there compare to what you might work with for an NCAA or other professional sports broadcast on TV? The equipment we use to capture the corps performances is identical to what is used on the highest end productions, whether it's the NFL or "Dancing With the Stars." 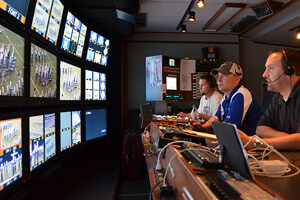 The broadcast truck that we use with all of its cameras, audio gear and monitors is the same truck that was used to cover the U.S. Open Golf Championship earlier this year, and it will be back in February at Lucas Oil to cover the Super Bowl. 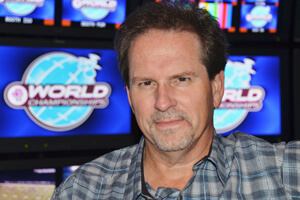 Because of how long I've been working on the World Championships and in the television industry, the people that I've been able to hire over the years are award-winning individuals who work at the highest levels of broadcasting. While they often come in knowing nothing about drum corps, I've now got guys who have worked on DCI broadcasts for more than 10 years with me. Some of those people have been around since I first took over the show back in 1987. 2. How do you and your crew prepare for the World Championships broadcast? on-the-fly decisions about which cameras to use. We do research all summer long by getting out, watching the drum corps and taking notes. Director Jeff Clark, who's another drum corps veteran (Glassmen and Blue Devils), painstakingly plans and executes the coverage of the corps. By the time we get to Indianapolis for the World Championships we know that the Boston Crusaders are going to send their whole horn line to the right end zone and that we need a camera down there so we can get that great shot looking down the line. We know the kid from the Bluecoats is going to do a somersault and we know when and where the Cavaliers' tenor drummers are going to drum upside down. We've worked hard to earn the respect of the corps' staffs so they are willing to share with us even the surprises they are holding for Finals night in advance. One of the things that has really helped us of late is returning to Lucas Oil Stadium for the Championships each year. This allows us to continuously develop our coverage; both the sound and the picture. Every venue has its own acoustical and aesthetic characteristics. Because we're in the same place—as opposed to being in Madison one year and the Rose Bowl the next—we already have a starting point from previous years and can see where we need and want to make improvements. It's a tremendous advantage to be in Lucas Oil because it's such a fabulous venue and because there's so much television horsepower available. It's extraordinary to be able to go back each year and say, "What can we do differently to improve on what we did last year?" 3. What happens between the time the World Championships have ended and the DVD and Blu-ray discs with those Championship performances are arriving in drum corps fans' mailboxes? Video Editing We come back from the Championships and have an enormous amount of material to process—Remember we record all of the performances on Thursday, Friday and Saturday of World Championships week. We make a live multi-camera recording during the performances and we use that to get all of the cameras at the right place at the right time. At the same time we're also recording all seven of the cameras individually. That allows us to go back after the fact and say, "You know what, we really needed to switch to that rifle toss a little bit earlier." That's the editing process. We want to make it absolutely perfect, with every cut on just the right frame. When you start to do the math on the number of corps performances, this stage of the process can become fairly time consuming. to capture performances at the ready. Audio Mixing After the video is ready we're already into the audio mixing process. Again, there's a sheer magnitude of data that we're working with here. For each performance we record 32 separate audio tracks, and those tracks are then loaded into a computer editing/mixing system. In addition to lining up and matching the audio to the video, we've got to sit down and play everything in real time to make decisions like: How loud is this going to be? Where's the mix level? Do we need to hear more of a corps' synthesized effects? Do we need less? That soloist is mic'ed, so how do we want to hear that? Do we want to hear it through the primary microphones, or do we want hear it more through the amplification tracks? The surround environment has to be created. Where do we want to put the listener? In the audience? On the field? Go back and and listen to Phantom Regiment's 2010 production. During the opening of the show, the first brass entrance comes from the left rear speaker, just like it came from the left tunnel for the live audience. DVD/Blu-ray Authoring All of the audio and video then need to be technically prepped for the medium on which they're going to be delivered. There's a certain type of audio and video file for the DVD.For the Blu-ray, there's a different type of video file that needs to be prepared. Once we've finally edited the video and we've mixed the audio, all of those elements have to go to the DVD/Blu-ray author who takes all of these separate elements and compiles them into a working disc. All of the technical man hours, from equipment and cameras to audio recording and computer files, are all reduced down to a simple disc that you can put into any player and crank up the volume. Quality Control and Replication After the authoring is done and before either the DVD and Blu-ray discs can be replicated in mass quantities, packaged and delivered, we have to go through each disc and check the content. We'll watch the Cadets' multi-camera performance and listen to that audio, then check the Cadets' high camera video and audio. The Blu-ray version also has to be screened, which also has two different video angles and two different audio options. Very easily you can spend more than two hours quality checking a single 11-minute corps performance. 4. 2011 will be Drum Corps International's third Blu-ray edition. Was there anything new or different you did in the production this year? in the bowels of Lucas Oil Stadium. 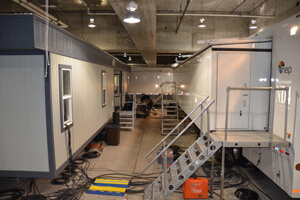 The most significant change has to do with the audio and where we placed the microphones on the field this year. With the corps' ever-growing number of speakers and other equipment now filling up the front sideline, our microphone placement over the years has always been evolving. Especially in recent years, corps have been placing their big speaker cabinets in front of our microphones. This has been a problem for us when trying to control the balance of the amplification of the corps' front ensemble with the sound of the instruments on the field. This summer we reached out to the corps and asked them to move their speakers a few feet forward from where they were typically used to setting them. So the corps' speakers moved a little bit closer to the audience, and we moved our mic stands closer to the front sideline to try to put them on the backside of the speaker cabinets. Since we don't have the amplified sound blasting straight into our field mics, it's made quite a significant difference. We can now actually control the volume of the pit a little bit better. By moving the microphones closer to the field you also get a greater presence from the performers on the field whether it's the drums or brass. We first tested this at the Southeastern Championship in Atlanta and were really happy with it. Hearing the audio mix this year on the DVDs, Blu-ray and the CDs, it's turned out to be a really, really great decision. 5. What differences will somebody find between the DVD and Blu-ray editions? The main difference between the two is that the DVD is standard definition and the Blu-ray is high definition. More simply, the Blu-ray has a dramatically clearer and more detailed picture than the DVD. Honestly, it's a night and day difference. For the audio, both the DVD and the Blu-ray use a 5.1 surround sound scheme. The DVD has Dolby Digital AC-3 surround. The Blu-ray also has AC-3 but adds DTS HD Master Audio, which is a significantly less compressed format. The DTS is a more natural sound that gives you greater dynamic range. It's warmer and can really handle the intricate audio peaks and valleys that we have in drum corps performances. DTS HD MA is known as "lossless" and considered by many to be the best format currently available. 6. For those who haven't made the jump to Blu-ray quite yet, how would you compare the quality of the DVDs coming out in 2011 to the DVDs DCI first produced a decade ago? of many used in creating the surround sound mix. The technology continues to improve. While we've always been able to capture the World Championships with the best gear, that gear keeps getting better. We're recording everything in HD and it stays HD right up until it goes to the DVD. I believe you end up with a better picture on the DVD because the HD cameras and lenses are better, and we also constantly re-evaluate our video encoding options. The same improvement in the audio that I was describing before is all carried over to the DVD as well as the Blu-ray. 7. What would you say is the ideal setup for someone to experience the World Championships on Blu-ray? First and foremost you need to have a high definition TV and a Blu-ray disc player. Blu-ray players are much cheaper than they were even just a year ago. I've seen them as inexpensive as $67 at Costco recently. Once you take your Blu-ray player and connect it to your HD TV, you're essentially in business for the very high quality picture. In order to truly experience the sound the way we have put it on the disc, you've got to have some type of surround sound system. That would include a left, a center, and a right speaker, in addition to left surround and right surround speakers and a subwoofer. That's what would be considered a 5.1 surround sound system (5 speakers, and the sub is ".1"). Your sound system would also need an amplifier or a receiver that supports either the AC3 Dolby Surround Sound or preferably the DTS HD Master Audio. 8. What if I only have an HD TV and inexpensive Blu-ray player, will I still be able to enjoy the Blu-ray without surround sound? The HD TV is going to be huge in terms of your viewing experience. Visually it gives you the closest thing we've got to actually being in the stadium. If you've got the most elaborate home surround sound setup, the Blu-ray experience is going to be phenomenal. But even if you only have a 32-inch Vizio HD TV and an entry-level Blu-ray player, it's still going to look and sound great and better than you'd see on DVD. By the way, remember that a Blu-ray player will play regular DVDs! Conversely, a DVD player will not play a Blu-ray disc. 9. What are some of the details that fans might be surprised that they can see while watching the Blu-ray? You can see the blades of artificial grass in the turf. From the high camera that's positioned all the way up in the 500 level of Lucas Oil Stadium, you can read all of the banners on the back sideline. 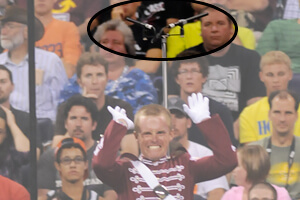 You can see the drum major's baton from the high camera. You can read every detail in the drums. You can see the performers' eyes and sweat running down their faces. You can actually sit and watch the high camera and see the detail of what the performers are trying to express. With a DVD there's just not enough clarity in the picture to see that amount of detail. 10. How do you go about creating the ultimate home viewing experience for drum corps fans? on Lucas Oil's 97-foot wide video board. Every year we set out to recreate the experience as accurately as possible. Where is the sound? What is the sound? What are the qualities of the sound? Put that with the high definition picture and you can re-live what you experienced when you were watching it live. If you weren't fortunate enough to be in Indianapolis for the World Championships, it's the closest you're ever going to get to experiencing what it was like in person. When I'm sitting there listening to the final mix, I honestly feel like I'm standing on the drum major's podium. You hear the crowd behind you and sometimes all around you. You get that feeling that you're actually in the stadium. The sound is so good, and you can hear every little detail. The Blue Devils snare line moves across the front of the field and you hear it perfectly, and the audio image tracks perfectly with the picture. You're never going to get this feeling watching a webcast or watching it on somebody's iPhone. There's nothing else that will approach the quality of watching and listening to this Blu-ray. 11. Where do you see the broadcast television industry going in the next five to 10 years? I think we're in a tremendous state of flux right now. The industry, much like every other, is being heavily influenced by the difficult economic times in which we are living. One of the reasons that Internet content is thriving is because it's so cheap. There's a tremendous price tag associated with quality, and right now, the economics of the world are creating a disinterest in those high costs. As a result we're seeing reality TV shows, and other programs that are inexpensive to produce. Everybody in the industry is feeling a real squeeze to do things for less money, use less cameras, travel less, and so on and so forth. These real world economics are pushing the ever-merging pathways of the computer world and the television world together. People are willing to settle for content on their computer—even though it might look bad—because it's inexpensive and convenient. I think that eventually we're going to get there. The technology for true high definition downloads and streaming HD video will eventually catch up so that DVDs and Blu-rays will be replaced by instantaneous access to huge "cloud" databases of movies and films, but we're still not there. 12. With technology constantly changing and improving, is it worth holding off on Blu-ray until the "next best thing" comes along? Right now Blu-ray is the absolute best delivery method we've got. It's better than broadcast, it's better than direct broadcast satellite, it's better than cable. Blu-ray is significantly better than any other way you can watch TV. That's why the studios are using it and why you see Blu-ray all over the place right now. Blu-ray is a perfect fit for DCI's quality-minded consumers. Is it foolish to invest in Blu-ray? No more foolish than it was to invest in any other format in the parade of technology including DVDs, Compact Discs and VHS. There's always going to be something better, but there's nothing better today. Listen to Blair talk more about the 2011 World Championship DVDs and Blu-rays in a recent podcast at marchingroundtable.com. 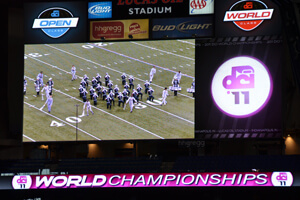 Drum Corps International's 2011 World Championship Blu-rays, DVDs and CDs are scheduled for release in mid-November. Pre-order yours today online at store.DCI.org or by calling 317.275.1212.